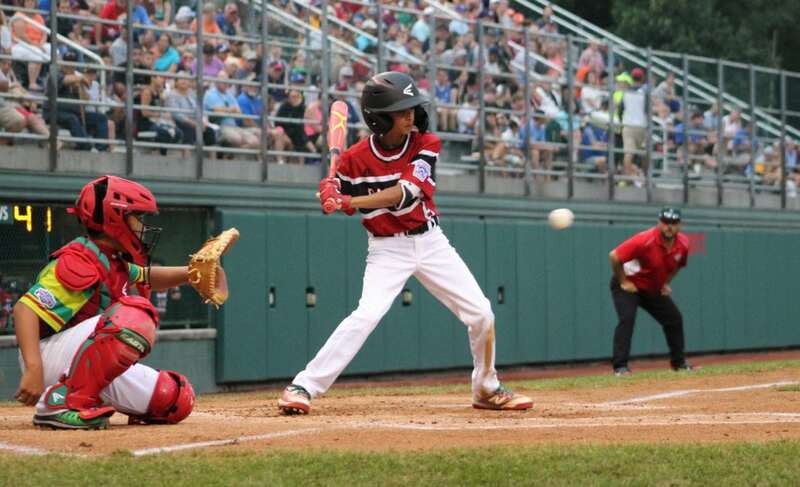 CARA MORNINGSTAR/Sun-Gazette Ty Grewal, 6 of Canada, bats as Emilio Cano, 6 of Mexico, plays catcher during the Canada versus Mexico Little League World Series game at Volunteer Stadium in South Williamsport on Monday. A closer look at Surrey, British Columbia of Canada’s 6-4 win over Mexico on Monday evening at Volunteer Stadium. PLAY OF THE GAME: A full count pitch, bases loaded, two outs, in a two-run ball game — Relief pitcher Nate Colina took a deep breath and fired away and immediately the ball was knocked back to him on a low line drive and he reached down to his right foot for the final out in a 6-4 win, leaving three runners stranded. “”I better not drop it,” Colina said of the play. CANADA PLAYER OF THE GAME: Nate Colina — Could go to Kai Sheck with his three RBIs, but Colina deserves this despite throwing just 14 pitches and picking up an RBI single in the first inning. Colina entered with one out and two runners on, he got the first out on a liner to left field –which many fans thought was down for a hit — walked one to load the bases, then made a shoestring grab on the low-hit liner. MEXICO PLAYER OF THE GAME: Fernando Lopez — Lopez’s three-run third-inning blast chopped the Canada lead down to two and his relief pitching effort kept Mexico in the game. Lopez threw three innings of three-hit relief while striking out seven on 87 pitches. BIG INNING: Canada’s bats started out hot as the offense put up a combined five runs in the first two innings. A four-single first inning put up two early runs on the board. In the top of the second, Canada put up three more runs when two straight two-out walks loaded the bases and a three-run triple by Kai Sheck, that was just out of the outstretched reach of the right fielder, emptied the bases and gave Canada a 5-0 advantage. Mexico came back with a three-spot in the bottom of the third inning when the first two batters reached on an error and balk, respectively, then Fernando Lopez’s 230-foot home run to centerfield got out in a hurry and Mexico cut the lead down to 6-4. BEST EFFORT: This play is lost in all the excitement but Mexico pitcher Erick Serrano entered in the top of the fifth inning with one out, two runners on and with his team facing a two-run deficit. The bases eventually became loaded with a single and still with only one out. But Serrano took a deep breath, got the second out on a full count strikeout and got the final out on a fielder’s choice groundout. HOME RUNS: Mexico’s Fernando Lopez lined a no-out, 3-2 pitch 230 foot three-run homer to dead centerfield in the bottom of the third inning to cut a five-run Canada lead down to 6-4. FLASHING LEATHER: With runners on first and second and one out, Canada second baseman Nate Colina fielded a hard-hit grounder, quickly tossed it to shortstop Joey Marino, who relayed it to first baseman Jordan Jaramillo for the 4-6-3 inning-ending double play to preserve a 2-0 lead. Canada shortstop Joey Marino made a glove catch on a bouncing grounder at his face to get the force out at second base and end the fourth inning with two runners stranded on base in a two-run game. WHAT IT MEANS: Canada sticks around for another meaningful game when it plays the Caribbean Regional champion from Puerto Rico today at 3 p.m. at Lamade Stadium. Mexico’s summer ends at the Series with a 1-2 record, but it will still play a crossover consolation game against an American team at a time and against an opponent to be determined.